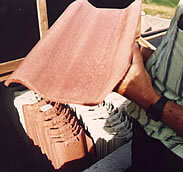 How good are Micro Concrete Roofing Tiles ? We have tested MCR tiles against most leading standards for concrete tiles: ASTM (US), British Standards, South African, Russian (former Soviet standards), and even tested them for freezing resistance according to DIN (Germany). They pass all of the generic requisites like impermeability, bending strength, etc. However, EcoSouth does have its own set of standards, and if a workshop consciously applies them they will almost certainly conform to their national standards (If those standards are not product specific). Micro Concrete is defined as a high performance concrete, and that is the reason why a 10mm thick MCR tile will pass tests similar to those of a common industrial concrete tile which is much thicker and heavier. To achieve this, the exact mixture of cement with well graded sands, and the adequate vibration specially conceived for this material, as well as near-perfect curing conditions are essential. 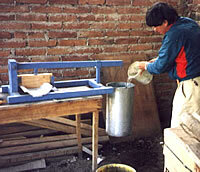 At the end of 2001 some 25,000,000 square meters were roofed with Micro Concrete Tiles and the yearly production of the 650 Latin American producers in 14 countries is around 3,000,000m2. That means about 50,000 roofs each year!! You are here: Home EcoMaterials MicroConcrete Roof tiles How good are Micro Concrete Roofing Tiles ?